NVSRB Home — Wetland Studies and Solutions, Inc. Exposed utility lines, damaged adjacent walking trails, and unsupported tree roots - and subsequent loss of otherwise healthy trees - were all caused by erosion along the stream's bed and banks. 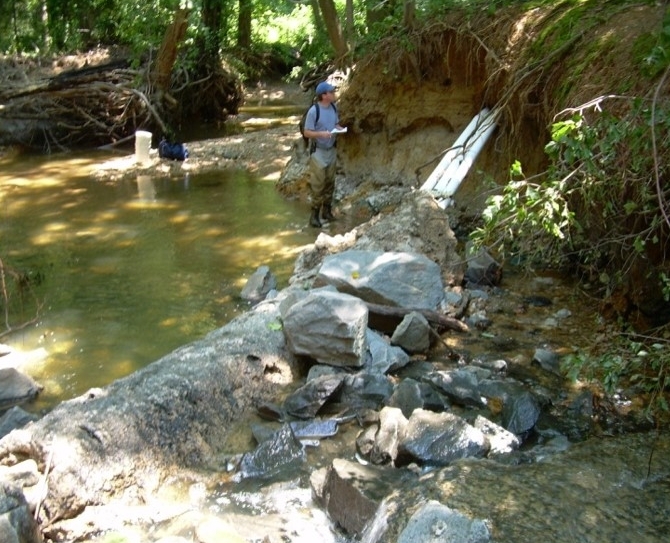 The Northern Virginia Stream Restoration Bank (NVSRB) is a partnership between Wetland Studies and Solutions, Inc. (WSSI) and Reston Association (RA). Since 2008, NVSRB has restored ±10.5 miles of degraded stream channels. NVSRB has completed stream restoration in The Glade and Snakeden watersheds, as well as Forest Edge North and South, Hickory Cluster, and Wiehle Avenue North in the Colvin Run watershed. NVSRB started on the ground work in February 2008, after more than five years of data collection and planning. Since then Reston has gained more than 50,000 linear feet of stream channel improvements. WSSI raised the stream bed to reconnect it to the floodplain, and placed rock structures to direct flow away from channel banks and create the riffles and pools necessary for ecological and physical integrity. In the development of Reston, forested lands were converted to buildings, roads, and other impervious surfaces that bar the infiltration of stormwater into soils. That causes higher runoff volumes during rain events which, combined with higher peak flows from outdated stormwater management techniques, results in higher flow energy in Reston's streams. The streams have suffered severe erosion and significant downstream sediment deposition. That erosion threatens adjacent trees, trails, and sanitary sewers, and the sediment impacts Reston's lakes and other community waters. WSSI is restoring streams using Natural Channel Design techniques that help the streambeds and banks withstand the high urban flow rates. This annual event along the restored Snakeden Branch is a cooperative effort between WSSI, RA, the Virginia Department of Game and Inland Fisheries, Northern Virginia Trout Unlimited, and the Wildlife Foundation of Virginia.